Winter has come and gone… spring has finally arrived and summer will be here in the blink of an eye. The next six months children will spend a majority of their time outdoors, riding bicycles and skateboards, playing baseball and football, diving into swimming pools, etc. Despite precautions, head injuries and concussions can still unfortunately happen, which makes this the prime time to discuss the important role that vision plays in traumatic brain injury. 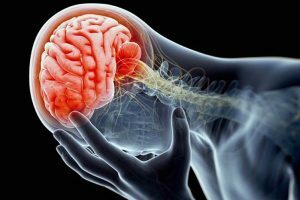 A traumatic brain injury can occur due to a variety of reasons, such as a major blow to the head, a tumor or stroke, or a neurological dysfunction. When someone endures a physical force to the head, he or she is often asked, “How many fingers am I holding up?” or “Can you follow my finger with your eyes?” These simple tests are often done to assess the individual’s vision; however, it has been found that nearly 90% of head trauma victims require professional vision care. The “finger gauge” tests are no longer an accurate visual examination. These visual symptoms are quite common in victims of head trauma, but fortunately they all can typically be decreased through one of the following rehabilitation programs: vision therapy, corrective lenses, or light therapy – all of which we provide. (We even have a video about it!) In fact, in a study published in the medical journal Optometry, 90% of traumatic brain injury patients who underwent vision therapy had significant improvement in their eye movement disorders. The problem is that vision problems are often overlooked in the initial evaluation of a patient’s traumatic brain injury. If you or a loved one suffers a brain injury, you should not ignore the visual symptoms and should see a vision specialist as soon as possible. If a vision problem is left untreated, it can lead to permanent damage and can even create additional problems. If you or your child has experienced a brain injury or illness of any kind involving the head, call us today to set up a complete vision evaluation. 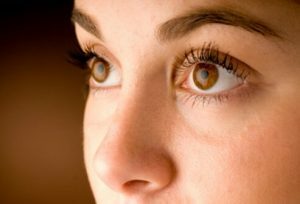 We have a variety of treatment options available that will alleviate any troubling vision symptoms that you may have. Our team of specialists understands that each individual reacts differently to brain trauma; therefore, we will do a complete visual assessment so that we can create a treatment plan best suited for you. 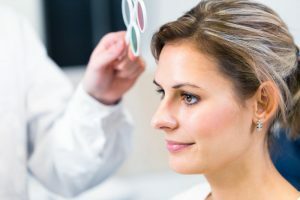 Lenses can help correct accommodative issues with the eyes, while light therapy can provide stress relief and relaxation to the traumatized brain through the eyes. Lastly, our vision therapy program works much like physical therapy, in that we use exercises and activities to retrain the eyes and brain to work together and function optimally. Regardless of which treatment is right for you or your child, we customize it to be age-appropriate for optimal results. An injury to the head is serious and should never be ignored. If you or your child has sustained a brain injury, contact us today at 618-288-1489 or by clicking here for a vision evaluation and treatment. Amblyopia, better known as “Lazy Eye”, is a common eye condition where decreased vision occurs in one or both eyes due to abnormal development of vision in infancy or childhood. In the simplest terms, it is when vision in one of the eyes is reduced because the eye and the brain are not working together correctly. Nearly 3 percent of the population suffers from amblyopia, and most people are not even aware that they have it. Amblyopia in adults is very common due to this. There are several types of amblyopia: strabismic, deprivation and refractive. Strabismic amblyopia develops from the misalignment of two eyes, during which one eye may turn in or out, up or down. Deprivation amblyopia results from a cataract, which is a physical obstruction of vision. Refractive amblyopia is caused by the inability of one eye to focus as well as the other (farsightedness or nearsightedness). Regardless of the type or cause, amblyopia affects individuals of all ages. In fact, it is the most common cause of decreased vision among children, teenagers and middle-aged adults. A common misconception of this vision condition is that it cannot be treated in adults. However, we have successfully treated patients of all ages with amblyopia. If you are an adult who is suffering from these symptoms and believe you have amblyopia, you should schedule an appointment with us for a complete vision evaluation. Amblyopia not only affects your vision, but it also can affect your depth perception, causing you to have problems performing everyday activities. For example, you may experience trouble driving, playing catch with your child, or walking up the steps in your home or workplace. If you have noticed that these tasks have become difficult, our vision therapy program can help you get your vision back on track. It is important that you come see us at Vision for Life, as a basic eye exam will not properly detect amblyopia. We will perform specialized visual acuity testing, which will accurately diagnose the condition. Once we have diagnosed amblyopia, we will then develop an individualized therapy program. Our vision therapy consists of simple exercises that encourage both of your eyes to work together with the brain equally. We also utilize specialized computer and optical devices, such as therapeutic lenses, prisms and filters to strengthen your weaker eye’s connection with the brain. Once you have advanced to the finals stages of your vision therapy program, your newly acquired vision skills will then be reinforced through repetition and integration with motor and cognitive skills. At Vision for Life, we encourage you to be proactive in your family’s eye care and to make an appointment with us if you believe you or your child is suffering from amblyopia. If amblyopia is left untreated, it can lead to permanent vision loss. Don’t wait because you think it is too late. Our office has corrected amblyopia in patients of ALL ages. Pick up the phone and call us now at 618-288-1489 or contact us here. What is Visual Field Loss? The visual field is the full area of what a person can visually see surrounding them. Visual field loss occurs when an individual experiences damage to any part of his or her visual pathway, which is the path that signals travel from the eye to the brain. There are many different causes of visual field loss, and the type of loss depends on what exact part of the pathway was damaged. Keep in mind that it also may not be a disease process, but a processing problem causing a temporary loss of the functional visual field. 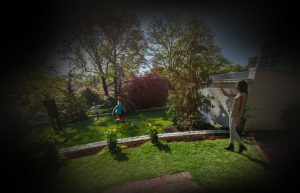 Regardless of the cause or type of the loss, the most common symptoms or signs of visual field loss is blurriness in one’s vision or complete loss (a blind spot) in one’s vision. However, in many cases, an individual is not even aware that he or she is experiencing visual field loss. A child or adult can experience visual field loss when his or her retina, optic nerve or visual parts of the brain, including the occipital lobe, is damaged. The most common causes of damage to the retina or optic nerve of the eye include glaucoma, coloboma, a toxoplasma infection, tumors, and age-related macular degeneration. If any of these conditions damage the center of the retina (the macula), the individual will most likely experience blurred vision. If the outside of the retina is affected, but not the macula, the individual may not even notice the visual field loss at all. Damage to the visual pathway of the brain can occur due to a variety of medical reasons, including a stroke, a traumatic brain injury, tumors in the brain or infections such as meningitis. In some cases of visual field loss, the damage occurred to the brain while the child was in the mother’s womb. The amount of loss a person experiences in his or her field of vision depends on what exact part of the brain’s visual pathway was affected. The health of your child’s vision or your own vision should never be ignored or neglected. At Vision for Life, we can properly evaluate and diagnose vision loss in both children and adults with a complete visual examination. Our developmental optometrist can examine an individual’s eyes for any possible signs of disease, as well as administer a vision field test to identify blind spots in your peripheral vision. Depending on the diagnosis, we will then choose the best treatment option for your child or yourself. For example, in some cases of visual field loss, a lens called a “prism” can be added to an eyeglass prescription to expand the field of view. However, in a majority of cases, vision therapy can help a patient regain some or all of their vision loss. At Vision for Life, we work with both children and adults with various vision problems that may affect their ability to read, write, perform in sports or on the job. With our motto, “Improving Vision Today, Ensuring Success Tomorrow”, it’s our main goal to improve our patient’s lives. Call us or contact us here today to schedule a complete visual examination at 618-288-1489, and to get your vision back on track! When focusing on an object, one of their eyes appears to be misaligned inward (cross-eyed), outward (wall-eyed), upward or downward. They have constant headaches or migraines. They often have to squint or tilt their head to read or view something. They experience double vision or motion sickness while reading. They have to strain their eyes while reading or doing near work, and they are often fatigued after. They have poor hand-eye coordination, as well as poor motor and sports skills. They cannot remain focused or stay still in class or while doing homework. They avoid reading and struggle when they do have to read. 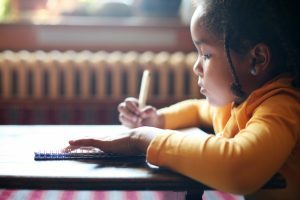 These symptoms can often mimic ones of a learning disability, which leads teachers and parents to believe that the child has ADHD or another disorder. When in reality, the child is suffering from strabismus, which can be treated successfully at Vision for Life. A major misconception among doctors and parents is that surgery is the best option to treating strabismus. However, this is NOT true. Surgery is simply a cosmetic fix that will not improve the child’s long-term vision into adulthood. At Vision for Life, our vision therapy program will not only straighten the child’s eyes, but it will also improve his or her vision for the long term. Our vision therapy program consists of personalized, age-appropriate exercises and activities that teach the brain and eyes to work together cohesively. When a child undergoes surgery to “fix” their strabismus, the neurological pathways between the brain and eyes are often severed. While the eyes may appear straightened after surgery, the brain and eyes will still not be communicating properly. This means that the child will still experience problems with his or her vision. With our therapy approach, we properly train the brain and eyes, which results in a lasting functional cure or improvement. At Vision for Life, our goal is to raise awareness about strabismus, so that people will no longer live their daily lives struggling to see and read properly. It is important that parents are aware of this vision problem and its symptoms, so that children are no longer misdiagnosed as having a learning disability or other issue. If you believe you or your child may have strabismus, call us today to schedule a complete vision evaluation. As we begin this new year, happiness and health should be a priority. If you think you or a loved one may be suffering from strabismus, we can help. Call us at (618) 288-1489 or learn more by visiting our website at http://visionforlifeworks.com/. Our in-office vision therapy has helped both adults and children thrive in work, school and play. If you have a little one at home or in your family, large, bright rattles and shake toys are ideal. These toys will help stimulate the child’s vision and improve their overall sense of sight. The “NogginStik Development Rattle” is great for babies 2 months and older. It has been reviewed as one of the best baby toys on the market. This rattle not only stimulates a baby’s sight, but also his or her hearing and sense of touch. 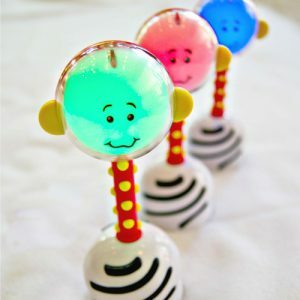 The head of the rattle changes colors, which will keep your child engaged and entertained. At this age, your child’s vision is still developing, making it an imperative time to strengthen his or her skills. This is also the time where your child is becoming more and more interactive with his or her toys, making play time even more fun! Baby books that are filled with bright colors, various textures and materials are a great gift. They not only encourage your child’s visual development, but they also will encourage your child to love reading! During this stage in your child’s life, his or her teeth are most likely coming in. The teething process is a stressful time for both your child and you. Why not get them a toy that not only soothes them during teething, but also enhances their vision? The “Green Keys Clutching Toy” is bright, and each key is a different color. This toy promotes visual development, as well as hand eye coordination. During this stage, your child is more interactive and mobile than ever before. You want to purchase toys that are educational, but that are also fun and able to hold your child’s attention. The “Stack N Spray Tub Fountain” can take away the dread of bath time. This toy stacks, spins and squirts! The bright colors and movement increases your child’s motor skills and improves their hand-eye coordination. At this age, the more interactive the toys are, the better. You want to shop for toys that encourage their eyes and hands to work together during playtime, which is extremely important at this age. The “Rolligo” is the perfect gift for the “terrible twos.” This toy has ten bright-colored spheres that can be pushed forwards, backwards or sideways in the rack. This safe, simple toy encourages sensory exploration along with motor skills. The constant movement of the multi-colored balls will keep your little one intrigued for hours during playtime. The list of toys that benefit your child’s vision are endless for this age category. At this stage, your child can really begin playing and interacting with other children there age. Try shopping for toys that are not only great for your child’s vision, but that also encourage teamwork. “Pattern Play” is a puzzle containing bright-colored blocks and cards that teach your child to sort and match. The cards are ranked in order of difficulty, ranging from beginner to expert, which means that your child can enjoy this toy for years to come! Children can work together to conquer the puzzle, and can also arrange the blocks into their own creative designs. This toy is a parent’s favorite, as it strengthens visual and social skills, as well as teaches patience and encourages children to use their imagination. With these toys tucked under your Christmas tree, you can rest assured that your children will not only love their gifts, but will benefit from them too! Buying your children vision development toys will help improve their overall mental, physical and social development. For a list of vision-strengthening toys, please visit http://www.mindware.orientaltrading.com. For more information on improving your child’s vision development, please call us today at 618-288-1489 or visit http://visionforlifeworks.com. The Vision for Life team wishes your family the happiest of holidays! According to a study conducted by the U.S. Department of Education and the National Institute of Literacy, 32 million adults in the U.S. cannot read. This means that 14 percent of the population cannot read. In honor of National Literacy Day that was on November 1st, Vision for Life is encouraging all individuals, both children and adults alike, to seek a complete vision evaluation if they experience difficulty reading. When reading, you must utilize 17 visual skills for optimal performance. These skills include focusing, eye tracking, aiming the eyes together and visual perception. Basic eye exams test an individual’s 20/20 distance vision; however, they fail to test the other 16 vision skills required to read properly. This is why vision deficiencies that are hindering a person’s ability to read often go unnoticed. Some common signs and symptoms of vision problems in a person include: not being able to read, not liking to read, headaches and/or fatigue while attempting to read, frequent rubbing of the eyes while reading, as well as trouble remaining focused and following the lines of the page. After we have diagnosed the vision problem, we can then develop an individualized vision therapy program for the patient. Whether the patient is a child or an adult, we can successfully perform age-appropriate exercises that will enhance his or her reading performance, making reading easier and more enjoyable. We have achieved successful results through our vision therapy program and our patients actually enjoy it, as it is fun and entertaining for children, as well as challenging for adults. Reading is a crucial skillset that is utilized daily. It challenges our minds and imaginations, while increasing our vocabulary, experiences and understanding of the world we live in. It has been reported that 1 out of every 4 children will grow up in the U.S. not being able to read. As a society, we cannot allow this alarming statistic to go unnoticed. As parents, we must take an active role in teaching our children to read and encouraging them to read throughout their lives. If you notice that your child has trouble reading age-appropriate books, call us today at 618-288-1489 or contact us here to schedule a vision evaluation. Also, if you know an adult that struggles to read, encourage him or her to contact us for a complete vision assessment. Together, we can put an end to illiteracy.